You’ll love this table set that customers consistently give 5 stars! Certain products of ours get great reviews from our customers and are best sellers year in and out! This handy and durable hobby table by Ashley is one of our most popular items. Aggressively priced for use in the home, office or studio, it’s great for the kids and professional draftsmen alike. The table top can be easily tilted and adjusted for height. The work space is 23.5 inches x 35.5 inches and is just the right size for hobbies, drafting, art and design work. The utility of this unit is enhanced with its three drawers and handy utility-rack. It also includes a trough for pencils and drawing materials. 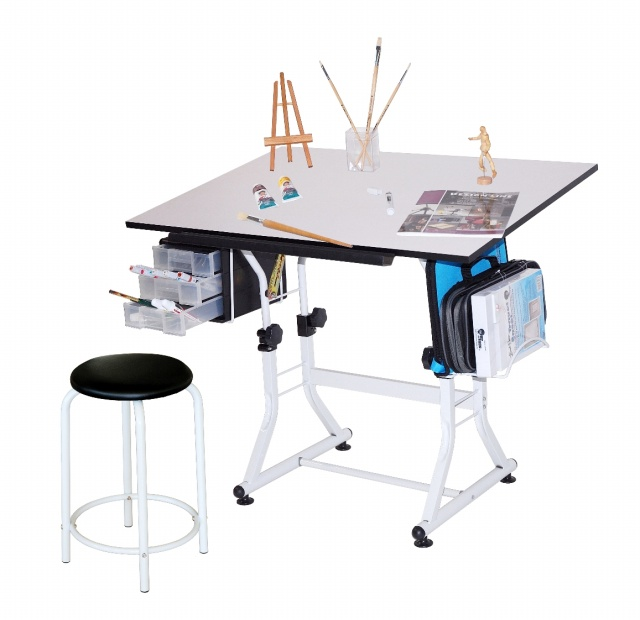 With the included padded stool, you’ve got an efficient work station for a variety of tasks. You’ll also love the new color we’ve added – a beautiful black with cherrywood top. 4.8 out of 5, Based on 9 Reviews. I just got it put together, and it was quite easy. I would have wished for no plastic parts, but It seems sturdy enough. I have two broken drawers and will be conyacting them about that. Two screws were too long and luckily I had washers or I would have not been able to finish putting it together. All in all It seems a great buy for the price. Well made and not too difficult to put together. Excellent value. My grandson, the artist, was thrilled with... gift. Win Win all around! Well designed and crafted product. Directions clear, video very helpful. Parts well fitted and organized. Beautiful finish on table top. Only 2 small frustrations: (1) The little hooks underneath the plastic drawers to keep drawers from coming out when pulled, snag on the adjacent drawers when both pulling out and pushing in the drawers, causing them to bind, and (2) the stool legs were slightly wobbly. Over all, a good experience and and an excellent product at a good price. Nice table. Table top was not pre drilled which made it difficult to assemble. It is a wonderful table.A great quality for the low price.My only problem was the assembly instructions.The wording was fine BUT the pictures did not help at all. If they could show the indentations that are needed on certain holes on certain legs and such,it would be very helpful. The table top was NOT pre-drilled. Thankfully my husband is a handy man and was able to figure all of this out himself. He did however put a few things on backwards and needed to disassemble then reassemble. This is because nothing is marked. Other then that it's a great product.My 14 year old daughter LOVES it! THANK YOU! The site made it easy to find all that we needed to make our son's birthday a huge success. The table is AWESOME and was really easy to assemble.